Home improvement enthusiasts are often looking for ways to enhance their home’s comfort and livability. If you are one of those people, your mind is busy thinking about what you can do to make your home just a little bit better. Fortunately, the cold winter months don’t have to slow you down. There are still plenty of winter home improvement projects for you to tackle. Here a few for you to consider. 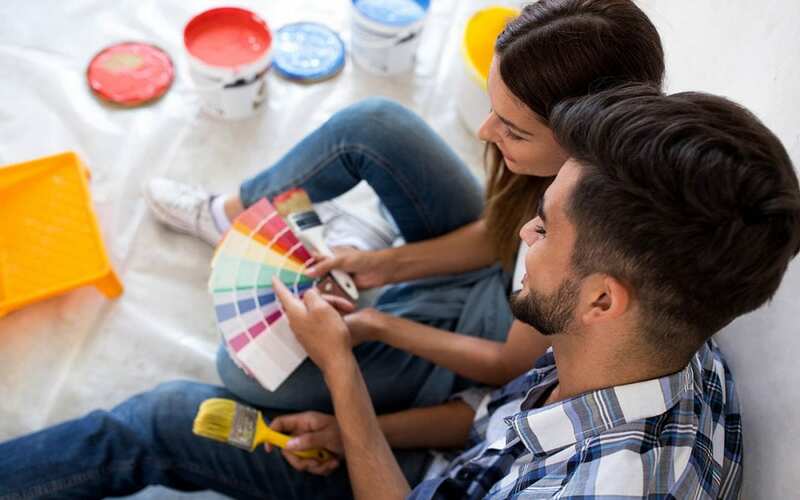 Add some color to your abode by doing some interior painting. Freshening up or changing the color of your walls can brighten up your home over the shorter days of winter. You could even set a goal to have a certain number of rooms, or the whole house, painted by the end of winter. This is a great winter home improvement project since there is a lot less indoor-outdoor foot traffic to deal with. Once the holidays are over, you can clear out a room and make a big difference with a newly refinished hardwood floor. If you have been living with laminate floors that are showing their age or carpet that collects dust, now would be a perfect time to rip that up and refinish the hardwood underneath or replace it with a new floor material that you love. Making updates to your bathrooms is a task that doesn’t require you to spend any time outside. It could be something simple like replacing faucets and showerheads or re-caulking the tub. Or, you may have the time go all out and do a total remodel. Make sure to turn your ventilation fan on if you are painting or using any strong chemicals. 4. Save some money with a winter home improvement project. Here are some ideas to help you save money on your heating bill this winter. Add Insulation: Take a look in your attic, garage, and basement and see if there are any places that could use more insulation. These areas are easy to get to and sometimes allow a lot of cold air into the house. Adding insulation will reduce your utility bills. Caulk: If you live in an older home with the original wood windows, you can caulk the interior of the windows in the winter. You’d be surprised at how much air can get in through old caulk. You can test a window by taping a piece of plastic over the entire window. If any air is getting through, the plastic will tell you immediately by moving with the draft. All of that cold air makes your furnace run more often to maintain the set temperature. Weatherstripping: You might have some doors or windows that are letting cold air into your home. Weatherstripping is effective at sealing those gaps and is easy to install. Insulate Water Heater: Especially if your water heater is in a colder part of the house, insulating the outside of it will lower your gas and electric bill. The insulation will help keep the water in the tank hot. You can buy a water heater blanket at a hardware store. 5. Attack your storage spots. While you’re stuck inside, think about a winter home improvement project that will help get your home more organized. You can clean and organize closets and drawers that always seem to turn into catch-alls for everything under the sun. You might even be surprised at some of the forgotten things you’ll come across. R. Sorensen Construction & Inspections serves Eastern Oregon with home inspection services. Contact us to book our services.